One of the Seven Natural Wonders of the World, the Grand Canyon is nothing less that spectacular. 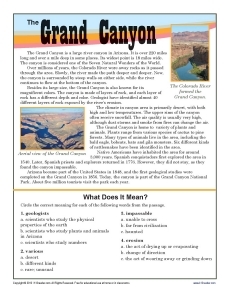 Your student will take a virtual visit to the canyon to learn what formed it and its history. He’ll also answer questions about the contextual meanings of words in the passage. The worksheet can be used in conjunction with Common Core Standards for Craft and Structure for 7th grade. It may be helpful for other grades as appropriate.